The Embrace Infant Warmer is a low-cost infant warmer designed for the developing world. 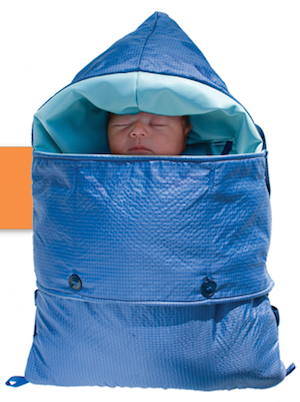 The design looks like a miniature sleeping bag, but in reality, will saves lives of vulnerable infants. It is a new, low-cost solution to help keep low birth weight babies' body temperature warm so they can survive and thrive in developing countries. 20,000,000 low-birth-weight and premature babies are born each year. This occurs primarily in developing countries, often in areas that don’t have access to innovations in modern medicine. One of the biggest problems these babies face is hypothermia: they are not able to regulate their own body temperature, and therefore cannot stay warm. In fact, room temperature for these small infants feels freezing cold. 4 million babies die within their first month of life. Those that do survive often develop life-long health problems such as early onset of diabetes, heart disease, and low IQ. Traditional incubators cost up to $20,000. Many of these babies could be saved with an incubator, but traditional incubators are expensive and not available, nor appropriate, for rural areas that don’t have access to electricity. “Many premature babies are never given a chance to make it out of the hospital,"" says Crystal, a missionary in Uganda, “Because there are no incubators, the babies are left to die. They are put on a table or directly in the trash without the comforting touch of their mothers in those final moments.” In light of these constraints, current solutions are in-home remedies. Desperate methods create to take care of these vulnerable babies include wrapping hot water bottles around their bodies or placing them near ovens. These solutions are unsafe and cause many infants to die unnecessarily. If given simple and proper medical treatment, many would not only survive, but grow and thrive. Embrace donates the low-cost Infant Warmer to populations in need through establishing partnerships with like-minded NGOs who are serving our target communities. Emergency Embrace, their humanitarian assistance program, supplies Infant Warmers to organizations working in areas facing dire situations on a short-term basis. Embrace is currently working in India and in emergency settings globally on a case by case basis. They aim to expand their programs by creating partnerships with local NGOs to distribute infant warmers around the world.